The Master Lock No. 4843DATSEN features a hitch alignment & vehicle back up camera. Installation is easy. 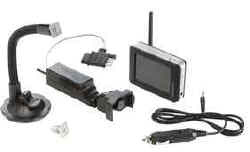 The magnetic base mounts to any metal surface of vehicle,; and camera plugs into existing vehicle tow wiring outlet. No wires to cut or splice.